In June 2013, the Show-Me Institute published a paper  comparing St. Louis and Kansas City’s expenses with six peer cities. One of the expenditures compared was debt service per capita. For Missouri’s two biggest cities, debt was high then and has only gotten higher since. In an upcoming paper by Show-Me Institute analyst Elias Tsapelas, we revisit those numbers. The chart below shows just the spending on debt. 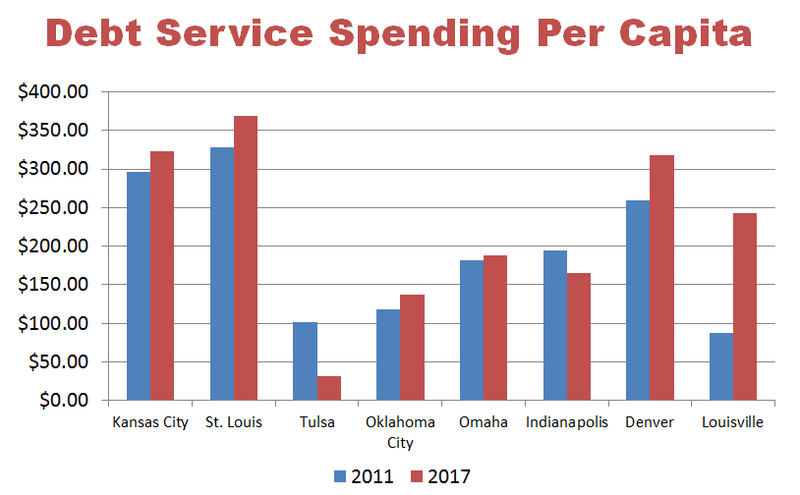 Kansas City's and St. Louis's debt service per person were the highest of the cities we studied a few years ago and remain the highest today, despite some dramatic increases in debt in Louisville and Denver. Tulsa and Indianapolis actually reduced their per capita debt payments! As Kansas City approaches a mayoral election and St. Louis yet again ponders subsidizing a sports stadium for wealthy would-be owners, city leaders need to focus on long term financial sustainability and stop buying expensive municipal baubles on taxpayer credit.